Posted On May 07, 2015 by Team iCynosure. Cricket dominates everything Indian. A sport that has the ability to wake people up in the middle of the night to watch their beloved game or rush back from work to catch the crucial few overs. People suffer setbacks with a single run out or a single run scored and attain nirvana with a single hit over the border line or a close stumping. This craze has translated from the Tests to One Dayers and have now upgraded to the T-20’s. Since International and Domestic cricket didn't suffice the hungry cricket playing cricket watching nation, we ventured out into the Cricketing Leagues. Not only is the game considered sacred but the players are nothing less than god-like to people. When players delight there is no limit to what the people may shower them with. Do you remember the moment when the all-time great Kapil Dev lifted the Cricket World Cup in 1983? I don’t because I was so little, I didn't even walk then. But I can conjure the image of it in mind whenever I want because I have seen it so many times. So when the same man who won a billion hearts in the one moment announces something incredible in the nation’s favorite sport, every Indian will stop in their tracks and listen. 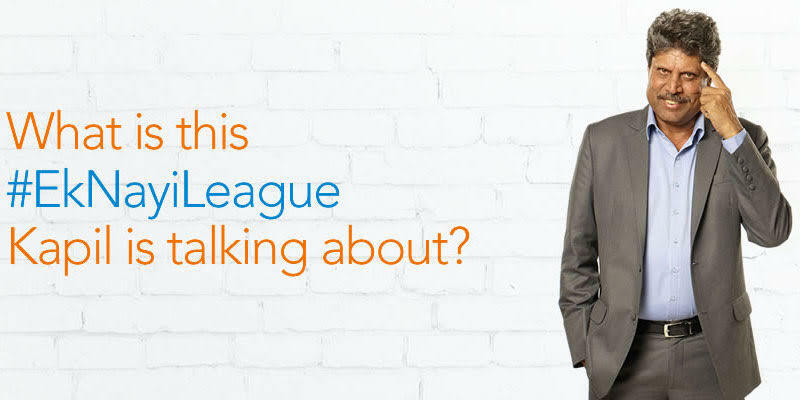 #EkNayiLeague meaning A New League has had me pondering as well. Cricket enthusiasts have been creating a ruckus on social media with their thoughts, ideas and even bets on what the new concept would be. There is hardly anything that the super cool brand custodian Kapil Dev gives away in his videos.
. Indian Women Players make Indian so proud….
. Coming soon, a very very unique and different league…. It surely is very confusing. What could a new league be all about? Thoughts have created a robust confusion in the mind from ideas like a parallel men’s league to a basic training league to a celebrity league, or a senior players league to a women’s league. Gosh it’s so confusing! Maybe it’s not even cricket, and could be a league for our national sport hockey, or for a more competitive game like football. Whatever league it is, it has to be about a group of people and not just one person… So sports like tennis, badminton, swimming, wrestling etc etc don’t stand a chance. It could be non-sports related I thought but how can it be? But it does seem valid…. If it is about money you will never play it with your heart, you will use your brains. Star players will never retire from the game, in fact the older they get, they become more and more invincible. And women players do really well as well in the monetary genre. So that settles it, the #EkNayiLeague has got to be something to do with money! And that’s my guess. What's yours? Leave me your comments!